Try a new twist to this year's holiday table by serving this colorful, hearty chutney to accompany your centerpiece ham. 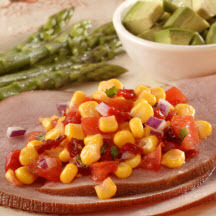 The chutney complements the sweet and smoky flavor of ham, as well as other grilled and roasted meats. In medium microwave-safe bowl, stir together all ingredients except cilantro. Microwave on HIGH (100%) for 4 minutes, stirring every minute. Stir in cilantro; microwave on HIGH for 1 minute. Makes about 1 1/2 cups chutney; 6 (1/4 cup) servings. Nutritional Information Per Serving (1/6 of recipe; 1/4 cup): Calories: 41 calories; Protein: 0 grams; Fat: 0 grams; Sodium: 73 milligrams; Cholesterol: 0 milligrams; Saturated Fat: 0 grams; Carbohydrates: 0 grams; Fiber: 0 grams. Recipe and photograph provided courtesy of Pork, Be Inspired®.